Roemer’s fescue grows in a variety of temperature regimes, typically in a temperate climate (18-32 inches annual precipitation at sea level) with maritime and Mediterranean influences. Elevation is from sea level to approximately 2500ft. 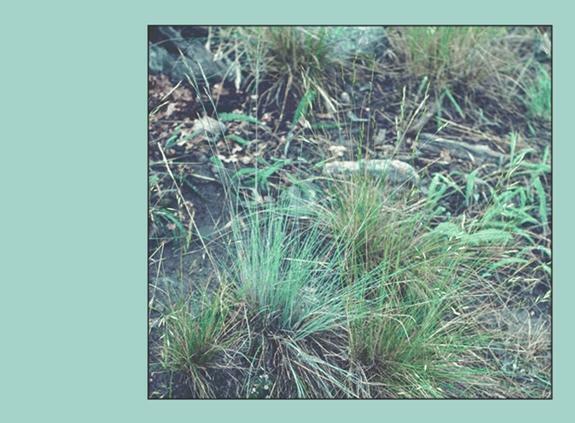 Roemer’s fescue has been described as a keystone species of prairies in the Pacific Northwest,, It is a climax indicator or dominant species and a major component of late-seral ecosystems. It is tolerant of summer moisture stress and therefore grows for much of the winter.9 Roemer’s fescue communities may rely on periodic disturbance such as soil and slope movement or fire to rejuvenate and maintain vigor of the plant community.,, It is a secondary colonizer (on-site or off-site seed sources) postfire. Age of seed is an important consideration when seeding with Idaho fescue Eddleman found germination was highest with new seed (3 months old) and declined with seed age, although cold temperatures (4 C) promoted germination for older (15 months) seed. Chambers observed a 13, 32, and 53% decrease in seed viability over 1, 2, and 3 years, respectively.21 However, Ewing reported relatively high germination rates in Roemer’s fescue stored longer than 5 years. Schmidt found that germination rates for seeds collected in the same year were typically high (80-100%). Seeds germinate in 8-10 days in greenhouse conditions throughout most of the year (January-March)23 Daubenmire suggests that the ability of Idaho fescue to survive drought is related to its ability to germinate in autumn and grow intermittently in winter during periods of favorable weather and so be sufficiently advanced in development by the time drought intensifies in early summer that it can aestivate. Schmidt advocates sowing seeds in the spring (early March), giving plants the advantage of growing during their natural seasonal cycle. There is no pretreatment of seed necessary for germination although, Goodwin and others found Idaho fescue seed requires after-ripening. The after-ripening period assures that at least 35% of the seed crop remains dormant for 6 months following dispersal - a strategy that promotes germination after winter precipitation has usually recharged soil moisture. Schmidt, David 1998. Restoration of a Prairie Ecosystem at the Yellow Island Preserve and the Propogation of Castileja hispida by Vegetative Cuttings. MS thesis University of Washington.